Location: Hatch Innovation, Hatch Oregon, and the social incubator on NE Sandy, HatchLab. She founded the nonprofit over ten years ago to enable ordinary folks to launch enterprises that improve communities – addressing local and global challenges. 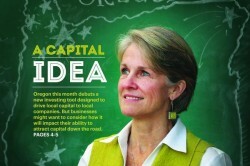 Recently, she authored the law that has become Oregon’s new crowdfunding exemption inviting the remaining 99% to invest in local business. Before founding the nonprofit, she ran intel.com/education, developing strategies for problem-based learning tools and programs online for over 30 countries. She has been an adjunct professor at five universities, and a speaker at hundreds of conferences, notably Oxford, Harvard, and Yale. She holds degrees in Anthropology and Education. On January 15th, 2015, new Oregon securities crowdfunding law was passed. On January 22nd, Hatch Innovation helped launch the first nine companies to make use of this law, as well as the platform via which people can become local investors, HatchOregon.com. Oregon is currently the most successful state to launch Community Public Offerings (CPOs), with over $140,000 invested across the nine companies currently using this law in eight short weeks. This workshop is intended to provide an overview of the new law, and then spend time answering attendees’ questions about how entrepreneurs might use Oregon’s new Community Public Offering (CPO).